The VIP Villas are made up of 15 Luxurious villas enjoying an unrivalled tranquil location in the central area of the fabulous Fuerteventura in an exclusive setting, offering privacy and peace within easy reach (700m) of Caleta de Fuste beach resort centre where all amenities including cafes, lively bars, great shops and nightly entertainment are to hand. 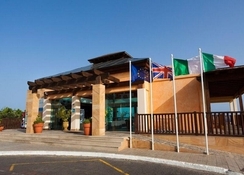 Usual tourist services are provided at the Club Caleta Dorada. The VIP Villas offer the ideal setting and great value for money for the discerning family seeking the perfect holiday destination. 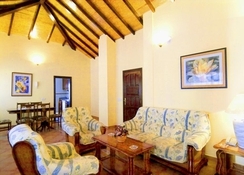 Book yourself a treat and enjoy the VIP Villas. Fuerteventura is the ideal spot to indulge in Diving or learn how to, with a plethora of diving schools and instructors offering courses for students of any levels and ages it would be a shame to miss the chance to see the wonders under the sea too! Ask the staff at reception for further information. 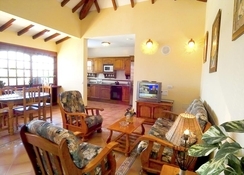 Food, drink and entertainment: the Villas are self catering, there are however a wide range of restaurants, cafes, bars and nightly entertainment at Club Caleta Dorada including live music and professional shows. Further entertainment can be found at the resort centre nearby and the marina 15mins walk away from the villas. 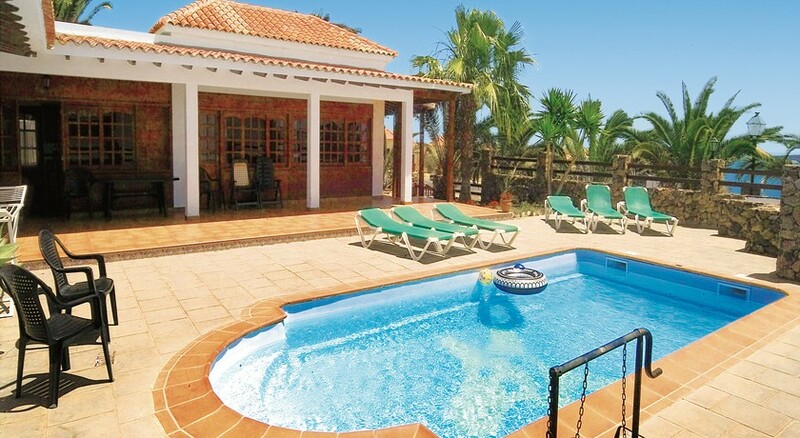 Each one of the villas has a private outdoor swimming pool, sun terrace complete with sun loungers and parasols. Communal facilities at Club Caleta Dorada includes 3 outdoor swimming pools, spacious sun terraces, sun loungers and parasols, animation team running games and activities around the complex throughout the day, 7 a side football pitch, multi sports court, squash court, table tennis, pool table, games room, well equipped gym. Further sporting amenities/activities are available nearby for hire/rental including sailing, surfing, diving, snorkelling, horse riding, golf and tennis. 3 kids outdoor swimming pools, small water park for kids with slides into main pool, animation team and organised fun. 24 hour reception (Club Caleta Dorada), currency exchange, safety deposit box (reception), postal services/stamps, cycle hire, car hire, excursion desk/facility, taxi service, tourist information service, mini market. The VIP Villas are beautifully designed and well appointed featuring contemporary furnishings and can accommodate up to 9 persons comfortably. All are fully equipped with full kitchen (kettle/dishwasher/washing machine/fridge freezer/oven/toaster), spacious living and dining room, billiard table Jacuzzi, solarium, garden sun terrace and private pool.